[...] I’ve been reading a bit about the IndieWeb movement, and am becoming increasingly interested in the possibility of a more decentralized model for distributing web content. To make a greater effort to create or at least have some hand in designing digital tools for my own work work. To this end, I’ve begun developing a (very small scale) Jekyll template for creating and disseminating oral history archives (called Oryll Hystory). With my scholarly background in both new media and archival theory, I’m hoping to use this as a prototype for thinking through questions regarding digital archives, circulation, and public humanities work. If that doesn’t work out, it will at least be practice for a bigger and better project. Feel free to follow the Github repository for the project if you’re interested. But don’t judge me–I’m at the early stages of the project and its currently extremely basic (and doesn’t look particularly good yet either). Welcome to the IndieWeb Rick! I particularly love your idea of using some of your digital knowledge and tools for research and education related work. In case you haven’t found it yet there are a growing number of educators, researchers, and practitioners applying IndieWeb philosophies and principles to the education space not only for ourselves, but for the benefit of our students and others. I hope you’ll take a moment to add yourself and some of your work to the list. If there’s anything any of us can do to help out, please don’t hesitate to touch base with us via our websites or in chat. Some great digital resources in here. This time, on clevercast, I reminisce about one of my earliest personal websites. What happened to its content? How did I create it? Is there any chance of restoring it back to greatness? I’ve still got a ways to go to recover some of my older content, but Jonathan has really done some interesting work in this area. Next month, two seminal image-sharing communities, FFFFOUND! and MLKSHK, will close their doors within a week of each other. There's a profound difference in how they're doing it as noted by someone who's previously sold off a community. This is a great little piece comparing and contrasting how to relatively similar online communities and social silos are shutting down their services. One is going a much better route than the other and providing export tools and archive ability to preserve the years of work and effort. 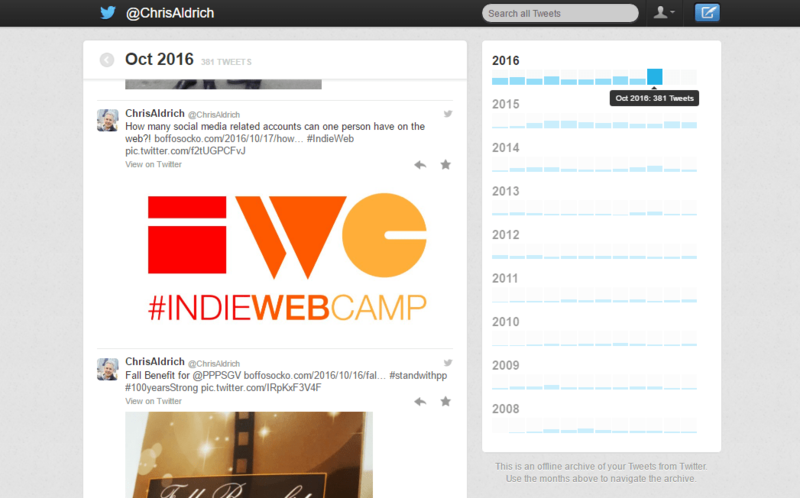 As part of my evolving IndieWeb experience of owning all of my own internet-based social data, last year I wanted a “quick and dirty” method for owning and displaying all of my Twitter activity before embarking on a more comprehensive method of owning all of my past tweets in a much more comprehensive way. I expected even a quick method to be far harder than the ten minute operation it turned out to be. I don’t like the way tweets displayed on a blog look. I am fussy about that. Would I like to have a searchable archive in my possession so I don’t lose it all when Twitter goes under? I would. So, for his benefit as well as others who are interested in the ability to do something like this quickly and easily, I thought I’d write up a short outline of what I’d originally done so that without spending all the time I did, others can do the same or something similar depending on their needs. If part of Mr. Rosen’s reply doesn’t give you enough motivation for why one would want to do this, IndieWeb.org has a laundry list of motivations along with a list of dead and defunct sites and social media silos that have taken pedabytes of data with them when they died. See the Request your archive button? Click it. After a (hopefully) short wait, a link to your archive should show up in your email associated with the account. Download it. Congratulations, you now own all of your tweets to date! You can open the index.html file in the downloaded folder to view all of your tweets locally on your own computer with your browser. Click the button to request your Twitter archive be emailed to your account email address. The best part is now that you’ve got all your tweets downloaded, you can almost immediately serve them from your own server without any real modification. Simply create an (accessible–use the same permissions as other equivalent files) folder named twitter on your server and upload all the files from your download into it. You’re done. It’s really that simple! In my case I created a subfolder within my WordPress installation, named it “twitter”, and uploaded the files. Once this is done, you should be able to go to the URL http://example.com/twitter and view them. The twitter folder in my WordPress directory with all of the downloaded files. As an example and to see what my archive looks like, visit http://boffosocko.com/twitter. Alternately one could set up a subdomain (eg. http://twitter.example.com) and serve them from there as well. You can change the URL by changing the name of the folder. As an alternate example, Kevin Marks uses the following: http://www.kevinmarks.com/tweets/. When you’re done, don’t forget to set up a link from your website (perhaps in the main menu?) so that others can benefit from your public archive. Mine is tucked in under the “Blog” heading in my main menu. The user interface of your Twitter archive. Unfortunately, while you’ve now got a great little archive with some reasonable UI and even some very powerful search capabilities, most of the links on the archive direct back to the originals on Twitter and don’t provide direct permalinks within the archive. It’s also a static archive, so you’ve periodically got to re-download and upload to keep your archive current. I currently only update mine on a quarterly basis, at least until I build a more comprehensive set up. You’ll notice that on both sites, when content has been syndicated, there’s a section at the bottom of the original posts that indicates to which services the content was syndicated along with permalinks to those posts. I’m using David Shanske’s excellent Syndication Links plugin to do this. The syndication block that follows posts on my site so one can easily/quickly see alternate versions in other social silos. Ultimately, I’d like to polish the workflow a bit and post all of my shorter Twitter-like status updates from BoffoSocko.com, but I still have some work to do to better differentiate content so that my shorter form content doesn’t muddy up or distract from the people who prefer to follow my longer-form content. Based on his comment, I also suspect that this is the same semantic issue/problem that Jay Rosen has. I’d also like to provide separate feeds/subscription options so that people can more easily consume as much or as little content from my site as they’d like. Both of these not only allow you to own and display your tweets, but they also automatically import new Tweets using the current API. Keep in mind that they use the PESOS philosophy (Post Elsewhere, Syndicate to your Own Site) which is less robust than POSSE, mentioned above. I’ll note that a tremendous number of WordPress-based plugins within the plugin repository that are Twitter related predate some of the major changes in Twitter’s API in the last year or two and thus no longer work and are no longer supported, so keep this in mind if you attempt to explore other solutions. Do you own your own Tweets (either before or after-the-fact)? How did you do it? Feel free to tell others about your methods in the comments, or better yet, write them on your own site and send this post a webmention (see details below). The IndieWeb movement is coding, collecting, and disseminating UI, UX, methods, and opensource code to help all netizens to better control their online identities, communicate, and connect themselves to others at IndieWeb.org. We warmly invite you to join us. This may also be of interest to those who’ve attended Dodging the Digital Memory Hole related events as well as those in the IndieWeb who may be concerned about their data living beyond them.